Mrs. ReaderPants: Genrefication Objection #6: Genrefication discourages students from reading widely across many genres. Genrefication Objection #6: Genrefication discourages students from reading widely across many genres. Honestly, as a librarian and a parent, I just want children and teens to read. I will do whatever it takes. I will stand on my head. I will roller skate. I will sing "Good Morning Baltimore" every single day. I do not care what my students read as long as they enjoy doing it and fall in love with it for life. Sadly, there are far too many children who love reading in lower-elementary school but hate it by the time they enter middle school. This happens when a student never falls in love with reading. When they never find that one book or series that they just could not put down. Possibly their parents or teachers forced them to read books they were not interested in. Maybe they were required to pick books on a certain reading level, regardless of personal taste or how many library books were available on that reading level. Perhaps they would not allow them to read the books they were interested in, as I’ve seen happen too many times to students who love graphic novels. In my experience, genrefication encourages students to love reading by grouping the books they love together in one place. I’ve seen so many students who check out Diary of a Wimpy Kid over and over. Their checkout history consists only of books from the Diary of a Wimpy Kid series. Do these students hate reading? Possibly. But they have clearly found a series they come back to over and over. Would it help if these readers could easily more find books that are similar to Diary of a Wimpy Kid? What if there were a whole section of hi-lo, easier-to-read books full of text accompanied by graphics? Books that are like Wimpy Kid but by different authors and illustrators, books that feature different characters and storylines. Would this child be more likely to find another book he might like? Genrefication benefits voracious readers as well. These are the students who are already reading widely within their favorite genres. I booktalk genre so much in my library that I frequently talk about similar genres. For example, I have a lesson where I compare Action/Survival with Mystery. These two are so closely related that the presentation is titled “Genre Twins.” The differences between High Fantasy and Light Fantasy are another way students who love one genre can be encouraged to try a new one. Paranormal and Horror are another example. Strong readers may also find particular authors they love, which may lead them to other genres. Authors like Neal Shusterman, Avi, Kate DiCamillo, Lisa McMann, James Patterson, Patrick Carman, Katherine Applegate, and even Stephen King can be found in multiple genre sections in my library. A reader who loves Lisa McMann's Crash series (paranormal) may also find that they love her Unwanteds series (fantasy). This may lead that reader to try other books in the Fantasy section. Even if they do not read widely among the genres right away, the important thing is that they are reading something. They may only read books from the Humor or Graphic Novels sections; please just be thankful that they are at least reading. They are in the library. They are engaged in these books. The more time they spend immersed in a book, the sharper their reading and vocabulary skills get. The longer they are engaged in reading and the more often they are in the library, the more likely they are to learn to love reading. The more likely they are to try a new genre. If they learn to love reading, they will gain the skills they need to read widely when they want or need to. So there you have it, folks, six common objections to genrefication. This post ends this series for now, but I am keeping my ear to the floor. 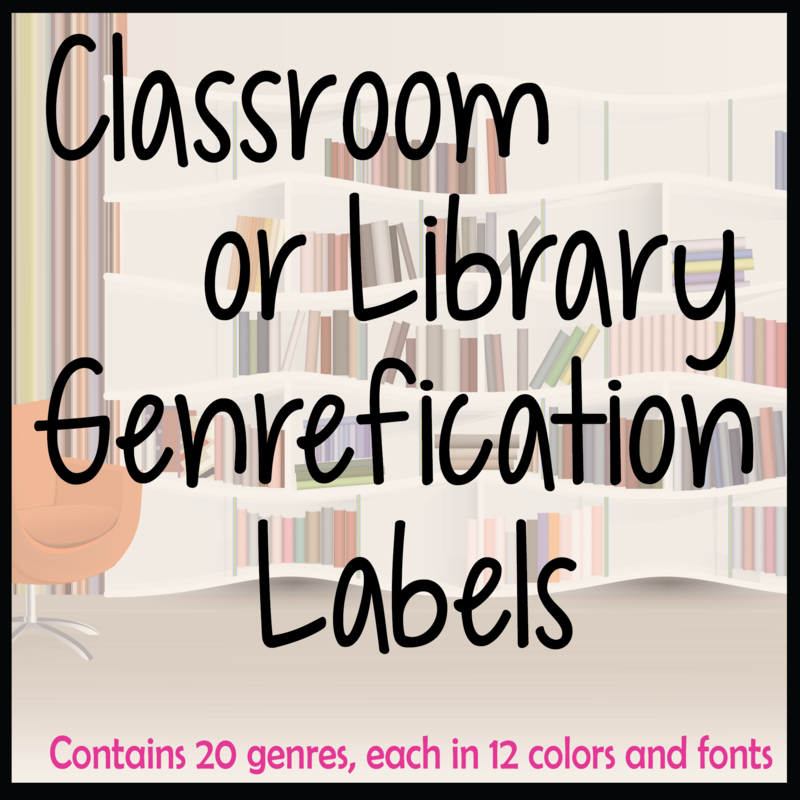 Genrefication can be a touchy subject for librarians, teachers, and even school administrators. When (not if) I hear new objections, I will post them here. Okay, NOW you can read my list of 25 Wimpy Kid readalikes. Or, if you haven't already done so, you can read my first five genrefication objections, linked below. Or, you can comment! What other genrefication objections have you heard? Objection #1--If I genrefy my library, my students will not be able to use a public or college library. Objection #2--It's the librarian's job to teach students to use the cataloging system, not enable students to be lazy. Objection #3--College professors increasingly report that their students come to college with no research skills. Objection #4--Genrefication is just the latest fad. Objection #5--Genrefication is inconsistent and non-standard. This was a great series! I, too, am a middle school librarian and completed my master's thesis on genrefication. All of this objections are on point and consistent with what I found. Some of the other common concerns I heard was "I'm not confident in my ability to put a book in the right genre where students will look for it" and "When I genrefied I had no idea where anything was...it made me look like I didn't even know my own library!" Just a few thoughts. Looking forward to seeing how it plays out. I officially genrefied at the end of the school year and will be introducing it to my staff and students in a few weeks. I LOVE genrefication. When I arrived at the high school I am in now, the first thing I did was genrefy the fiction, and students suddenly started browsing a lot more. Especially by adolescence, students sort of know what they like to read, so I think it helps them find good books. If students don't know where to start, I just ask them to tell me a book they've read at any time that they loved and then I walk with them to that genre! Bingo! Normally we find something within 10 minutes!